Evo & Grace: The WanderLusts: The Spirit Of Filipino Christmas In The Nutcracker. 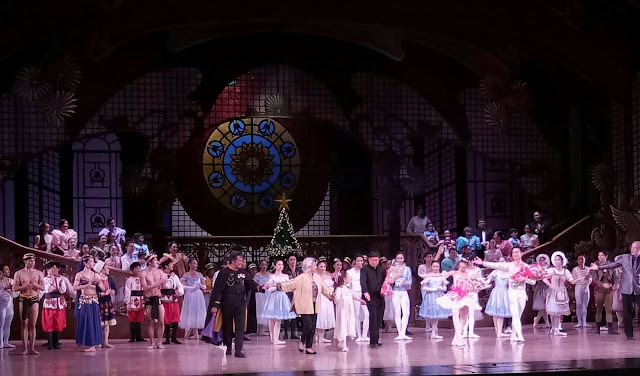 The Spirit Of Filipino Christmas In The Nutcracker. Alice Reyes choreographed her first own version in 1982 with Rita Dureza and Cynthia as Clara, Leslie Browne, Effie Nañas, Maricar Drilon and Toni Lopez Gonzalez as the Sugarplum Fairy and John Meehan, Nonoy Froilan, Brando Miranda and Adam Sage as the Nutcracker Prince. In 1991, Reyes' version was restaged by Nonoy Froilan with Mylene Aggabao and Naomi Tolome as Clara, Gina Katigbak and Melissa Cuachon as the Sugarplum Fairy and Mario Esperanza and Jinn Ibarrola as the Nutcracker Prince. Edna Vida's original choreographic version premiered in 1987 with Maria Veronica Fargas and Maria Leilani R. Da Silva as Clara, Lisa Macuja, Cecile Sicangco, Gina Katigbak, Melissa Cuachon and Ida Beltran as the Sugarplum Fairy and Nonoy Froilan, Conrad Dy-Liacco, Brando Miranda and Jun Mabaquio as the Nutcracker Prince. It was then restaged in 2003, with Wendy Esteban and Lynn Leveille as Clara, Kris-Belle Paclibar, Mica Bernas and Hanedy Sala as the Sugarplum Fairy and Clark Rambuyon, Irish Abejero and Jojo Mamangun as the Nutcracker Prince. This year, both Reyes and Vida's versions, for their third production of its quintessential 48th season, Ballet Philippines, the first resident company of Cultural Center of the Philippines revived and relived the classic and iconic Christmas ballet in the world, "The Nutcracker" Returning to Ballet Philippines as guest artist courtesy of Japan Foundation and Tan Yan Kee Foundation is Nobuo Fujino, former Senior Artist of Australian Ballet and Principal Dancer of Hongkong Ballet. He played the role of The Prince in Ballet Philippines production of The Sleeping Beauty in 2011. Alternating with Fujino as The Prince are Victor Maguad (Shoes++, Peter Pan, Giselle, Manhid, Opera and Swan Lake) and Lester Reguindin (Pusong Wagas, Illustrated Dialects and Swan Lake). This Christmas ballet presentation became a homecoming celebration as former and future members of Ballet Philippines made a unison performance. A significant highlight during Act 1, women wearing ternos and tapis and men wearing balck tuxedos, chaquetillas, wing collars, butterfly neckties and cummberbands graced, swayed and danced in "Rigodon de Honor". Another delightful treat were party children from different dance school who gave meaning for this Yuletide season. To complement this full-length ballet in two-act, musical director Gerard Salonga conducted the 42-piece ABS-CBN Philharmonic Orchestra, the music of legendary Russian composer Peter Ilich Tchaikovsky, known for Swan Lake (1876), Sleeping Beauty (1889) and The Nutcracker (1892). Set in the Philippines during the Spanish colonial era in the 1920s, Ballet Philippines promised the retelling of Vida and Reyes' holiday classic that, audience will experience and explore images of Noche Buena, dance with Rigodon de Honor, illuminate the bright lights of fireflies, see the beauty of bougainvilleas, and the symbolic toys and sweets of Christmas. As the curtain raise up, the Filipino themed set designed by National Artist for Theater Design, Salvador Bernal warmly welcomed and greeted the audiences of the gala night with awe. The grand ballroom featured huge carved anahaw leaves in styrofoam made famous by Isabelo Tampico, backdroped by framed translucent capiz shells, complemented with two beautiful chandeliers hanged at the twin staircases and transitioned from small to large Christmas tree at the center through flying. And the spectacle continues from the Kingdom of the Fireflies symbolizing the arrival at the Kingdom of the Dolls at Act II. For a complete Nutcracker experience, Ballet Philippines partnered with Chrysara, a creative manufacturing company who specializes in housewares, gifts and accessories, established by Ballet Philippines Founder and Artistic Director and National Artist for Dance Alice Reyes, to showcase Filipino talents, artisans and craftmanships.The Nutcracker collectibles featuring characters like Clara, the Rat King, the Nutcracker Prince and the Sugarplum Fairy are exclusively available at Ballet Philippines. Chrysara's Nutcracker line are available online at, www.facebook.com/balletphilippines and at the CCP Main Theater Lobby from 1st to 10th of December 2017. Proceeds will go to the Noordin Jumalon Scholarship Fund, which aims to support the growth and development of aspiring and promising young students of Ballet Philippines. For only 1,000, audience will get an Orchestra Center ticket for Matinee show and seat at "The Nutcracker Tea Party" Meet and greet Clara, the Sugarplum Fairy and the Nutcracker Prince, decorate a pointe shoe and soothe Tea Leaves tea and other Bizu treats are also at stake. The party will only kick in on December 2, 3, 9 and 10, right after the matinee performance of The Nutcracker at the CCP Main Theater Mezzanine. Slots are limited. The Nutcracker runs from December 1 to 10 at the CCP Main Theater. Call Ballet Philippines at (+632) 551-1003, CCP Box Office at (+632) 832-3704 or Ticketworld at (+632) 891-9999. Log on to: www.ticketworld.com.ph Connect and follow Ballet Philippines through: Facebook: www.facebook.com/balletphilippines Twitter: @balletphilippines Instagram: @balletph .